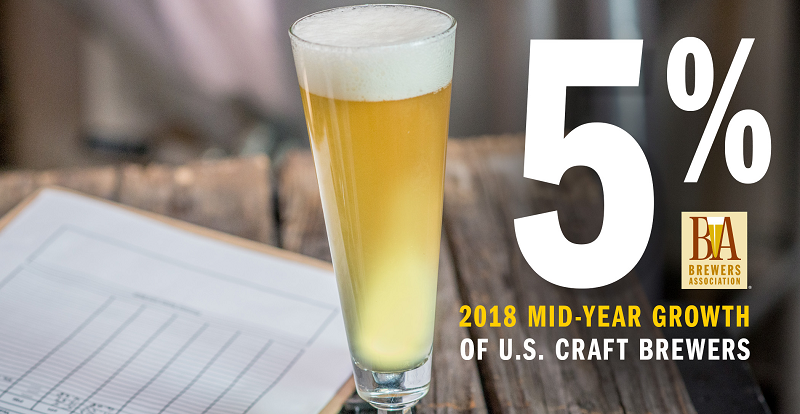 BOULDER, Colo.—Growth for small and independent craft brewers remained stable for the first half of 2018, according to new mid-year metrics released by the Brewers Association (BA)—the not-for-profit trade association dedicated to small and independent American brewers.Production volume for the craft segment increased five percent during the first half of 2018. Craft brewer definition: An American craft brewer is small, independent and traditional. Small: Annual production of 6 million barrels of beer or less (approximately three percent of U.S. annual sales). Beer production is attributed to the rules of alternating proprietorships. Independent: Less than 25 percent of the craft brewery is owned or controlled (or equivalent economic interest) by an alcoholic beverage industry member that is not itself a craft brewer. Traditional: A brewer that has a majority of its total beverage alcohol volume in beers whose flavor derives from traditional or innovative brewing ingredients and their fermentation. Flavored malt beverages (FMBs) are not considered beers. The Brewers Association (BA) is the not-for-profit trade association dedicated to small and independent American brewers, their beers and the community of brewing enthusiasts. The BA represents 4,800-plus U.S. breweries. The BA’s independent craft brewer seal is a widely adopted symbol that differentiates beers by small and independent craft brewers. The BA organizes events including the World Beer Cup®, Great American Beer Festival®, Craft Brewers Conference® & BrewExpo America®, SAVORTM: An American Craft Beer & Food Experience, Homebrew ConTM, National Homebrew Competition and American Craft Beer Week®. The BA publishes The New Brewer®magazine, and Brewers PublicationsTM is the leading publisher of brewing literature in the U.S. Beer lovers are invited to learn more about the dynamic world of craft beer at CraftBeer.com® and about homebrewing via the BA’s American Homebrewers Association® and the free Brew Guru® mobile app. Follow us on Facebook, Twitter andInstagram.